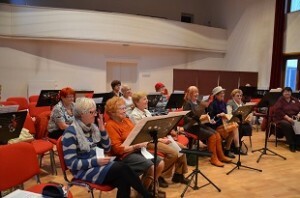 In addition to the regular concert activity, Janáček Philharmonic offers leisure activities to seniors (but not only to them), during which they can deepen their love for classical music. Regular meetings (once a month) are adjusted to their participants so that they develop not only musically, but they also for example find similarly “handicapped” friends and spend a pleasant afternoon in their company. The aim of the meetings is to increase the theoretical and practical musical knowledge and skills. 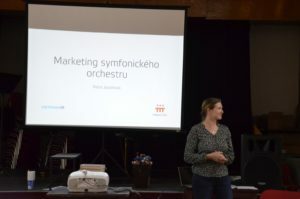 The individual lessons are composed of a practical music workshop (singing, dancing, sheet music reading, playing on various instruments – some of them handmade or Orff instruments), led by the experienced and hugely popular lecturer Martin Ptáček, and lectures where the participants meet leading Czech and foreign artists or professionals from the music industry. Participants are guided to their own musical growth in an interesting, interactive and above all entertaining way, they become acquainted with all the important and interesting events in the Philharmonic Orchestra, and they also take a look backstage. 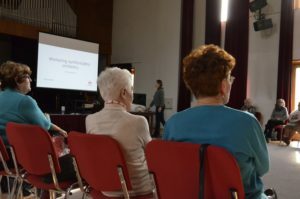 In the last season, for example, a musicologist Jan Špaček talked about the work of Dmitri Shostakowich, whereas his colleague, Petr Kalina, talked about the work of Sergei Rachmaninoff and Alexander Borodin. Jiří Zahrádka, on the other hand, revealed the life of the work of Leoš Janáček. Also the JPO chief conductor Heiko Mathias Förster came and joined the discussion with the particiants of Philharmony PLUS. This year we launch the First Year again! Applications for the first and second years can be sent electronically to foltynova@jfo.cz or by post to the Janáček Philharmonic Ostrava, p.o., Filharmonie Plus, 28. října 124, 124, 702 00, Ostrava. If sending an electronic application, do not forget to include “Philharmonic Plus” in the subject line. After payment (point of sale Janáček Point), you will receive the Philharmonic Plus Listener Card. The meetings of the first year will be held every first Tuesday of the month. The meetings of the second year will be held every third Tuesday of the month. 2. 10., 6. 11., 4. 12., 8. 1., 5. 2., 5. 3., 2. 4., 7. 5. 16. 10., 20. 11., 18. 12., 22. 1., 19. 2., 19. 3., 16. 4., 21. 5.